The guys from Hamann Motorsport have been teasing us for quite some time now, showing us their program for the BMW M2 piece by piece. We’ve seen almost everything so far except from the aero parts and today is the big day. The German tuner decided to take the veils off their complete setup and this new project looks great. 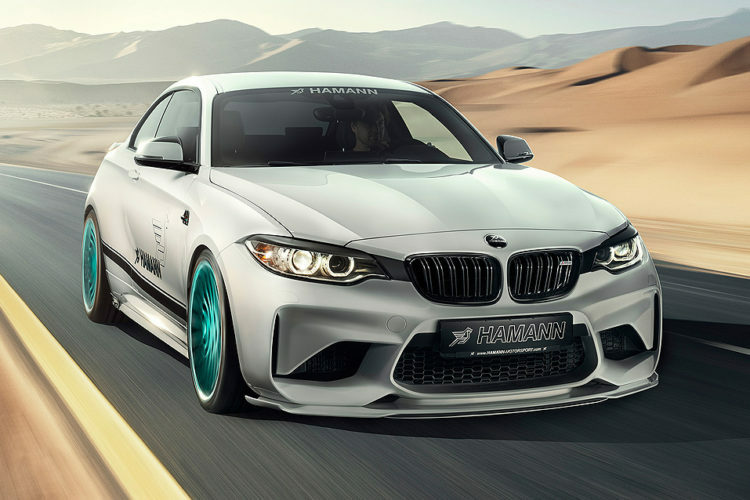 As you’ll be able to tell from the photos, the Hamann BMW M2 includes a complete aero kit made of a front spoiler that expands across the whole vehicle width and compliments the radiator grille at the bottom of the bumper. There’s also an optional, centered carbon-fiber insert underneath the mesh grilles that does bring a bit more style to the table. On the sides you’ll notice the new sill that come with extra wing tips right in front of the wheel arches as well as the Hamann Anniversary Evo wheels painted blue. Round the back there’s a new spoiler attached to the boot lid as well as smoked out taillights and a new diffuser that compliments the quad tailpipes of the Hamann exhaust. As far as performance gains go, the engine upgrade from the German tuner will add 50 HP and 65 Nm to the grand total of the N55 mill. That means a Hamann M2 can put out 420 HP and 530 Nm (390 lb-ft) of torque, plenty for a car of this size. Oh, and in case you want to deck your car’s interior as well, you’ll be able to do so with a set of Hamann pedal covers.